The New Castle County Chamber of Commerce invites you to refer a friend or associate to the Chamber during our Membership Drive! To close out the Drive, you and a guest are invited to attend a special Wine and Cheese Networking Event on Tuesday, April 16th at the Harlan Flats on the Wilmington Riverfront! Join us as we provide potential and new members the opportunity to learn about the Chamber and meet existing members and recognize existing members for their recruitment efforts! Cost to attend: bring a client or business associate who is not currently a member. Make sure to register your guest(s) when you register! Start now and keep the referrals coming! The membership drive starts now and ends at the event on April 16th, so start referring potential Chamber members NOW to increase your chances to win! Click here to submit your referrals. Bring in the most new members by April 16th and WIN the Grand Prize...an Apple iPad Pro, courtesy of NerdIt Now! 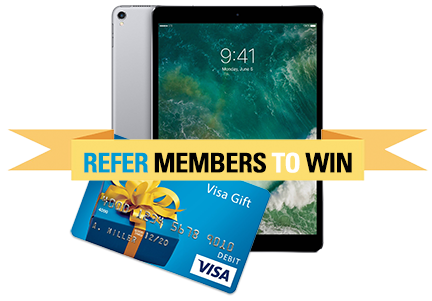 Each referral you provide is a chance to WIN the 2nd Prize...a $200 VISA Gift Card! Drawing will happen at the event on the 16th! Your ticket to this exclusive event is bringing a client or business associate who is not currently a member! Be sure to include your guest in your registration!